sorry, written on phone... above commentary was mine, not bepf's. LOVE LOVE LOVE how the Civic Arena crowd lost their collective crap when that goal was scored. Kasparaitis? In overtime of a game 7? Surrrrrre, why not? I cut the Sportscenter highlight for this one. I was at this game. If memory serves me correctly I actually bought student rush tickets. I think that was the loudest I have ever heard it there, the crowd that game was bonkers from start to finish. Thanks Orlando. Thought something like this might be good lockout therapy. Crowd was nuts that entire game. I was there as well, student rush. That was like right before my 15th birthday lol. The game wasn't even sold out though. I think it was 1000 or 1500 under capacity. Never heard the crowd louder than when Jagr scored in OT, even to this day. I was in section B2 behind Brodeur when Straka passed it to Jagr and he put that puck in. I hugged people I didn't even know that day. I still have my ticket stub from that game. You could student rush quite a few playoff games during those years. They weren't the guaranteed sellout they are now. 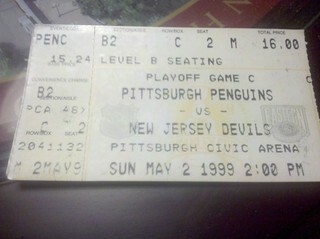 I went to quite a few playoff games for cheap back then. It turned me into a season ticket holder years later. Big Easy Pens Fan wrote: Stanley Cup Finals. $16.00. Even thought that wasn't the finals, fast forward 11 years and you have to add a 3 to the front of that price. We're still in a lockout, so let's keep this going. The thing is, I don't know how this one (Malkin's 50th) isn't here already. JUst one more for the severly depressed...like me. Editing here: Check out the girl wearing the pink hoodie at the 32 second mark. She could have cared less about the hockey game. What a half-hearted, late clap! I get nostalgia tears watching that. I get nostalgia tears watching clips from the Mellon.